Finally an affordable way to restore your concrete / cement! Prestige Concrete’s professional Concrete Renewal division specializes in high quality, cost effective solutions for unsightly concrete. 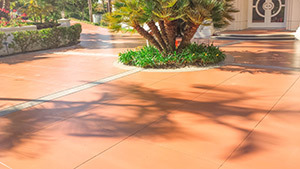 If your concrete is discolored, stained, worn, cracked, faded, chipped, damaged or just plain ugly, we have several cost effective solutions to solve these problems. Our solutions are geared toward maintaining as much of the natural look of the concrete as possible while improving and enhancing its appearance. We are not just another overlay company that leaves you with a fake looking concrete surface that looks like it has been painted, plastered or stucco-ed. Best of all, our solutions are the lowest priced on the market and guaranteed to last. Our most innovative and exciting solution for problem concrete is our Armor Cap™ system. Armor Cap™ is a proprietary system for refinishing your concrete. Armor Cap™ is a cement based product that penetrates into concrete, maintains much of the character of the existing concrete, and leaves a fresh new look. It bonds tenaciously to concrete, it’s easy to maintain, and it comes in 40 standard colors. It can also be stained to produce a variegated, old world appearance. Cracks, blemishes and defects virtually disappear with this amazing concrete resurfacing system. Vertical surfaces such as walls and curbs. Public Facilities, Schools, Universities, Parks, Hospitals, etc. We use concrete stains that penetrate into the surface of the concrete leaving a very natural appearance, much like the process of staining wood. We also use acid stains that react with the concrete creating dramatic effects. Our stains are durable, economical and come in over 30 different colors.